Commonly referred to as the Destroying Angel, Amanita virosa is a deadly poisonous fungus. 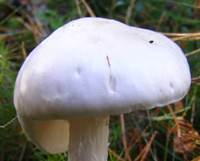 The Destroying Angel is found infrequently in the lowlands but is more plentiful in mountainous areas in Britain and Ireland. 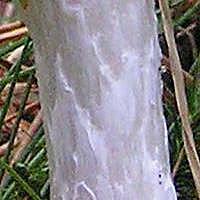 It is not uncommon in low lying areas in northern Scotland and is a very common find in Scandinavian conifer forests (of whichb there are many!). In northern Europe Destroying Angels usually appear in July, August and September. A similar species, Amanita verna, commonly known as Fool’s Mushroom, appears in springtime. These two pure white amanitas are almost impossible to distinguish from macroscopic characteristics alone, but if you are into chemical testing then it is worth noting that Amanita verna does not react to potassium hydroxide (KOH) whereas the flesh of Amanita virosa instantly turns yellow. For most people the different fruiting times of Amanita virosa and Amanita verna are fairly conclusive. In any case separating the two is not everyone's objective: Destroying Angels are not fungi that anyone would want to collect as food! Originally described from Sweden by Elias Magnus Fries, and named Agaricus virosus (most gilled fungi were initially placed in a giant Agaricus genus, now redistributed to many other genera), the presently accepted scientific name Amanita virosa dates from an 1836 publication by French statistician Louis-Adolphe Bertillon (1821 - 1883) in Dechambre, Dict. Encyclop. Sci. Médic. 3: 497. It's worth restating that all of these pure white Amanita fungi contain the same deadly toxins as are found in Amanita virosa, the Destroying Angel, and Amanita phalloides, the Deathcap (or Death Cup, as it is more generally known in North America). 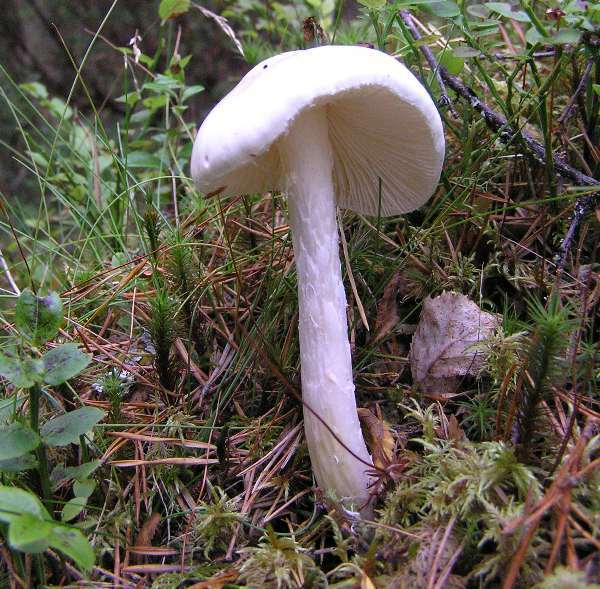 Unlike Amanita phalloides, however, not only is Amanita virosa pure white, like the supermarket button mushroom, but it also looks gorgeous and it does not have the repulsive smell that, to anyone with a nose, should betray the evil within a mature Deathcap. Destroying Angels contain a complex group of poisonous substances called amatoxins. Contained not only in certain amanitas but also in some fungi from the genera Galerina, Lepiota and Conocybe, amatoxins initially cause gastrointestinal disorders with symptoms such as diarrhea, nausea and stomach pains occurring within five to twelve hours. Cruelly, the symptoms usually fade away for several hours or even a day or two, tricking the victim into thinking that they are recovering. When in due course the symptoms return with a vengeance, it may well be too late: kidney and liver damage is already underway. Without treatment, coma and eventual death are almost inevitable. Often, people hospitalised late into a poisoning episode can be saved only by major surgery and a liver transplant, and even then recovery is a precarious, painful and protracted process. Anyone gathering mushrooms to cook and eat needs to be able to identify this poisonous amanita fungus and to distinguish between a young Destroying Angel and an edible Agaricus mushroom such as the Wood Mushroom, Agaricus sylvicola, which occurs in the same habitat as Amanita virosa, or the Field Mushroom, Agaricus campestris, which is often found in fields bordered by deciduous trees with which Amanita virosa can be associated. Destroying Angels at the button stage could also be mistaken for edible puffballs such as Lycoperdon perlatum, the Common Puffball, or Lycoperdon pyriforme, the Stump Puffball; however, if the fruitbody is cut in half longitudinally the volva of Amanita virosa, the Destroying Angel, would immediately become apparent. One piece of advice that I received many years ago has helped me to enjoy eating wild mushrooms while avoiding the risks of poisoning by deadly Amanita toadstools: before even bothering to learn about the key identification features of the world's best edible fungi - and there are plenty of them - take the trouble and make the time to learn to identify, without any shadow of doubt, the two most deadly fungi on earth: Amanita virosa and its close allies that are all commonly referred to as the Destroying Angels, and Amanita phalloides, variously known as the Death Cap, Deathcap or Death Cup. In the meantime, 'never eat a Amanita' seems to be a pretty good maxim, and especially when applied to white members of the Amanita genus. Caps of the Destroying Angel are 5 to 10cm in diameter, pure white, and without any marginal striations. The cap is initially egg-shaped and then campanulate (bell shaped) or occasionally almost flat but with a broad umbo, and is often tilted on the stipe. 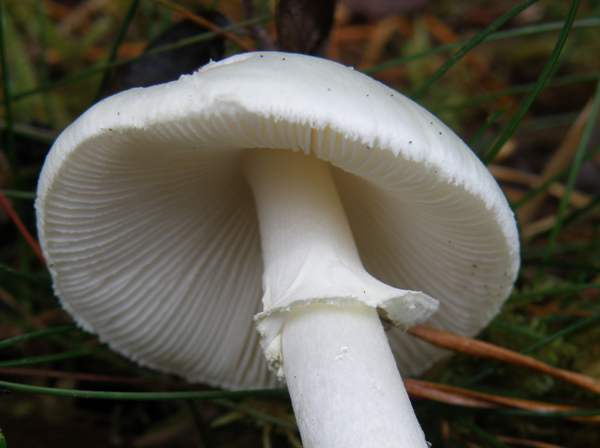 Although some young caps carry white remains of the universal veil, they soon wash off in wet weather and are rarely seen on mature caps. 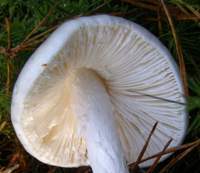 Amanita virosa gills are white, free and crowded. 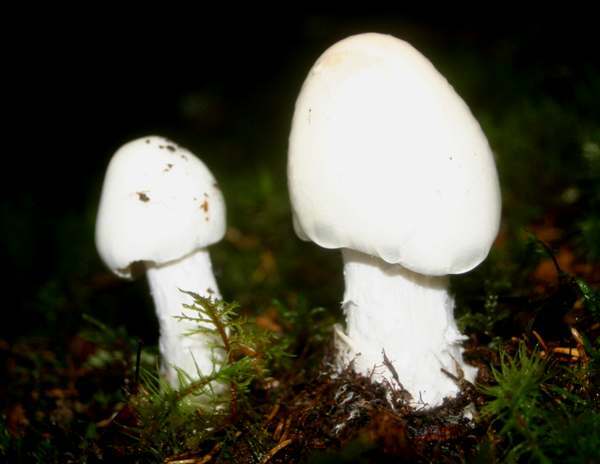 Stems of Destroying Angels are 9 to 15cm tall, 0.6 to 2cm in diameter, and often slightly curved; pure white and fibrous with an ungrooved, fragile ring high up on the stipe. The large, sack-like volva is usually buried deep in the soil. Spherical or subglobose, 7-8μm in diameter. Mature specimens have a faint sickly and unpleasant odour (easily missed, especially in the outdoors on breezy days). Because this mushroom is deadly poisonous it must not be tasted. Often found at the edge of deciduous or mixed woodland, Amanita virosa is more common at higher altitude. Amanita citrina var. alba usually retains velar fragments on the cap; it has the sharp smell of new potatoes rather than a sweet sickly odour. 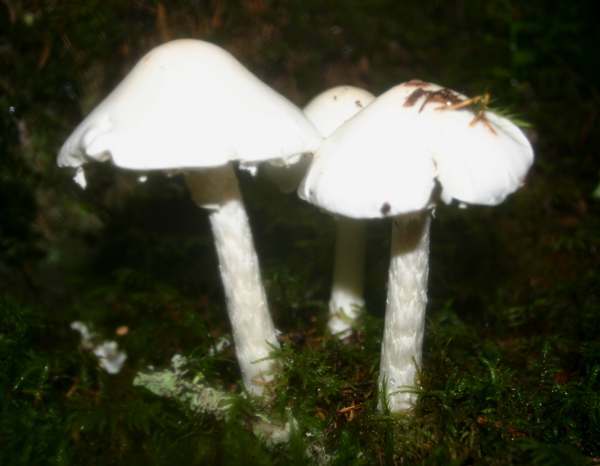 Young caps of Amanita virosa could be collected by accident when gathering edible Agaricus species such as Agaricus sylvicola, the Wood Mushroom; gills of Amanita virosa are pure white, whereas the Agaricus species have gills that are initially pink and later turn brown.